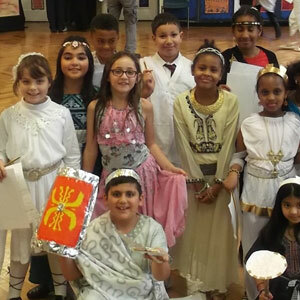 Take part in rowing a great ship across to Rome, sell slaves at the Forum, re-create the Roman Baths, advise Caesar from the senate and help Emperor Hadrian protect his army from the Celts and Picts. The experienced actor will arrive at your school with a pop-up theatre. From the moment you meet the Roman Slave Trader to the building of Hadrian’s wall your pupils will be gripped on history. 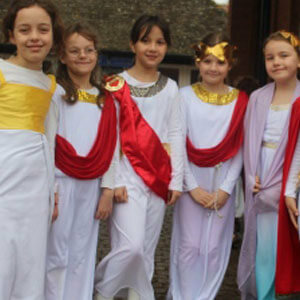 They will perform short scenes from the Roman Times; using drama, freeze-frame, and role-play the children will be encouraged to interact with the performer. This workshop definitely has the WOW factor. We guarantee you will not be disappointed. The workshop continues with a visit from a consul from Rome who needs help with building Hadrian’s wall & defeating the Celts.The Create History workshop produces work that lends itself to being used for class projects. 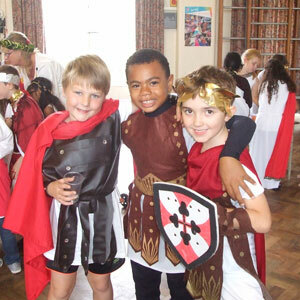 This interactive workshop helps pupils to get an understanding of living in the past.